FAQ ~ What do I need to know to play in WADA? When do the league seasons run? Our teams are separated into 3 flights: A, B and C generally playing on Monday, Tuesday or Wednesday night. Teams are comprised of a minimum of 4 and maximum of 8 players. Or players may join as a group or team by securing a Sponsor Bar location and entering a Team Application. Contact one of our Regional Directors with any questions. We play in DC, Maryland and Northern Virginia. Virginia is split into the East and West regions based on the Fairfax County Parkway. ​Click for a list of our current season sponsors. Players pay $25 shooter's fee per team per season. Shooters may play on multiple teams subject to WADA Rules. ​The sponsor bar pays $80 per team per season. How can I join WADA? WADA Lifetime Membership is a one-time $10 fee. ​Players generally join a team then pay the membership fee with their shooters fee. ​OR click here to complete a form to become a WADA member. INDIVIDUAL: Highlights are recorded on the weekly scoresheets by the Captain and submitted to the Executive Director. 9Marks, T80s and 6Bulls are tracked and displayed on the website. A pin is delivered for the 1st, 5th and 10th 9Mark and T80. A first 6Bull coin is also awarded. Milestone awards are distributed at a WADA Annual event to 25th, 50th and 100th 9Mark and T80. ​CHAMPIONS receive individual shirts and DIVISION CHAMPS receive bar plaques. Players are ranked per WADA rules. A. Players receive a rating based on singles win point (WP) percentage known as the Weighted Aggregate Rated Percentage (WARP). 1. 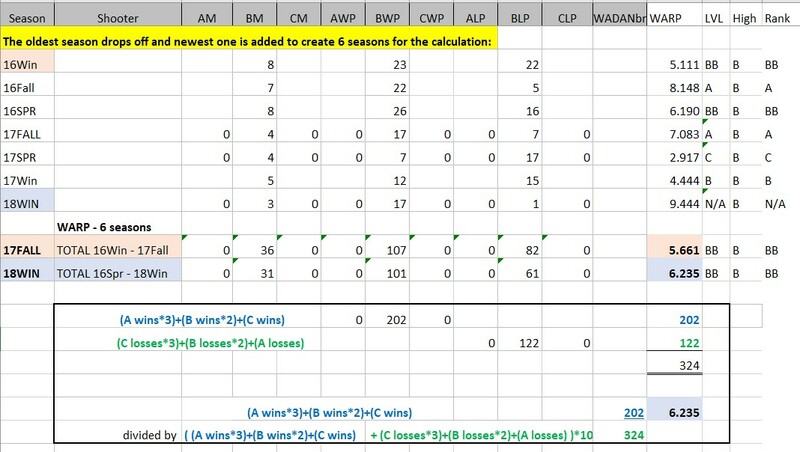 The wins and losses are rated so that wins count more for the higher league (A3, B2, C1) and losses count more for the lower league (C3, B2, A1) for comparison. B. All win-points and loss-points are totaled for a predetermined number of seasons which will be referred to as the Rolling Average Cycle (RAC). C. A “RAC” should not include more than the last 6 seasons as a MAX. D. A player must play 7 games (21 points) in the RAC to get a WARP. ​ 1. Anyone who plays A league during the RAC may not be ranked any lower than B. ​ 2. Anyone who plays B league as their highest level during the RAC may not be ranked any higher than A. ​ 3. Anyone who plays C league as their highest level during the RAC may not be ranked any higher than BB. ​WARP is calculated by first adding together the players' Singles Stats for the "last 6 seasons". What is the format of play for "A/B" league? Click for a copy of the excel scoresheet. What is the format of play for "C" league? If you notice on the score sheet there are only four places for names in each of the first four rounds. There is no limit to how many can play in the team game. 4 players will play an average of 4 games each, 8 players will play an average of 2 games each (5 = 16/5 = 3.2, 6 = 16/6 = 2.67, 7 = 16/7 = 2.28). But you also have to make sure that if a player or two don’t show up that you have at least four to play the match. We recommend having at least six players on any new team, but that also depends on commitment. If you have four guys who will show up every week then you don’t need to carry more than one extra otherwise you limit everyone’s playing time. Games and formats: Cricket is slop and points meaning that if you aim for 18 and hit a 20 you can count it. If you have them closed and your opponent doesn’t then you get 20 points. 401, 501, 701 legs are all free in (anything counts) and double out (you must reach zero on a double). 301 is double in and out. Cork Calls starting order is home team calls cork and closest to the cork calls 401, 301 or cricket as the first leg of the game and starts. The loser of the first game calls second leg of the game (401, 301 or cricket) and THEN the cork and the winner of the cork calls starts the leg. If it’s 1-1 then the home team again calls the cork and closest to the cork calls 401, 301 or cricket as the final leg of the game and starts.